You are here: Home > Why use a wire rope thimble? Anytime a wire rope is bent so it can be attached to a hanging point, there is a risk that the eye could be crushed. The addition of a wire rope thimble to the eye protects the rope by guiding it into a natural curve and creating an extra layer of support. Standard/Light Duty. Our line of standard to light duty thimbles are zinc plated and available in multi-packs. Heavy Duty. Heavy duty wire rope thimbles are also zinc plated like standard or light duty thimbles, but are hot dip galvanized, which creates a thicker coating than on standard/light duty models. Type 304. A type 304 indication mean the thimble is manufactured in stainless steel which offers resistance to corrosion on the surface. Regular/Light Duty 316. Standard/light duty thimbles are sold in multi-packs, but offer a 316 stainless steel material to make them resistant to high moisture or corrosive environments, particularly in marine applications. Heavy Duty 316. A corrosion-resistant 316 stainless steel combines with heavy duty design, great for tough applications in marine environments. Heavy Duty 304. Stainless steel offers corrosion resistance, ideal for general heavy duty uses where the thimble will be exposed to outdoor elements. Extra Heavy Duty 304. 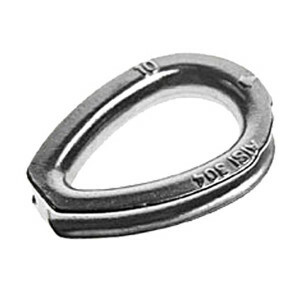 While not as corrosion-resistant as type 316 stainless steel, these extra heavy duty stainless steel wire rope thimbles offer the highest strength. 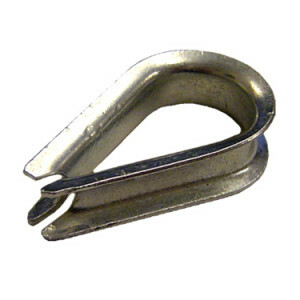 To shop from our full selection of wire rope thimbles, shackles, turnbuckles, and more, check out our Rigging Supplies & Rigging Hardware category.